Wolverhampton Wanderers Football Club is an English professional football club that represents the city of Wolverhampton in the West Midlands. The club was originally known as St. Luke's FC and was founded in 1877 and since 1889 has played at Molineux. They currently compete in the Football League Championship, the second highest tier of English football, having been promoted from League One in 2014 after a solitary season at that level. 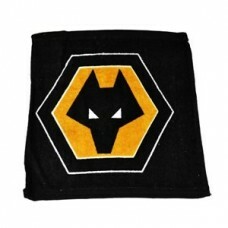 This Wolves Face Cloth is an officially licenced product and is manufactured for Wolves FC. The fa.. The Wolves Players Golf Gift Set is produced under license for Wolves Football Club and is an exce..